With the release of the U.S. Bureau of Justice Statistics’ 2014 Survey of State Criminal History Information Systems, eye-opening facts on criminal records at state-run repositories have put their effectiveness into question. In fact, the survey revealed that 20 states have over 3 million unprocessed or partially processed court dispositions, ranging from 200 in Michigan and North Dakota to over 1 million unprocessed in Nevada. Additionally, 8 states report 25% or more of all dispositions received could not be linked to the arrest or charge in the state criminal record database! As employers and property managers like you depend on the criminal information on the applicant’s background screening report to make effective decisions, this gap of unprocessed and unmatched criminal data at the courts is alarming. Some applicants, like Raquel Vanderpool, have already been affected. Although the charge for falsifying a prescription when she was 19 was dismissed and the record sealed, Vanderpool lost her job 15 years later because the criminal record was never removed. If these states’ criminal repositories are failing to timely and accurately report criminal offences, who’s to say you might not have hired or rented to an individual you might not have chosen with the knowledge? With 11 states reporting at least a 50 day backlog between when a felony case is decided and when that record is entered into the criminal history database (with 18 states unable to say how long their own backlog is), it’s clear that this issue won’t be resolved any time soon. There are over 3,200 County Clerks in the United States who serve the people as the official keeper of records. When you go to the ballot box, consider the candidates who will make maximum accuracy a priority. The release of the U.S. Bureau of Justice Statistics reveals that choosing a background screening provider is more important than before. Your tenant or employment screening firm should be up-to-date on recent legislation and news to maintain a high industry standard. To combat the holes in many states’ criminal record databases, choose a background screening company that scans your applicant through many databases and has experience catching criminal data discrepancies. 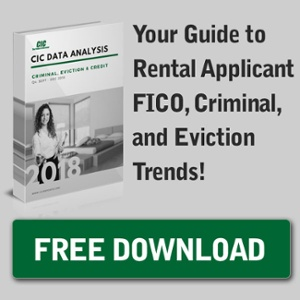 Although many have argued that all recording aspects of background screening for tenant and employment purposes should be handled on a state and federal level, these statistics showcase that many states’ repositories aren’t up to the challenge. Realistically, there will always be some sort of margin of error, but it’s up to you to decide who can reduce that percentage the most and help you make the best decision. To learn more about accurate criminal data, visit www.CICReports.com. Learn More about Legislation & Statistics that will Affect You! Can you Rely on your Tenant Screening Reports?